Even if you take great care of your teeth and have excellent oral hygiene, hot summer months can bring unique challenges for maintaining a healthy mouth. Some activities are great for the body, but can actually be harmful to the teeth, especially during the hot summer months. Swimming is a wonderful exercise, however swimming in a pool with too much chlorine may pose a risk to our teeth. Chlorine is a chemical disinfectant used in swimming pools to kill bacteria, but too much chlorine can be harsh on tooth enamel. An ideal pH for pool water would be between 7.2 and 7.8 on the pH scale. PH levels lower than that can cause enamel erosion as water continuously circulates into the mouth while swimming. Enamel erosion can occur whenever there is prolonged acidity in the mouth and can lead to loss of tooth enamel. As enamel erosion progresses, the teeth become sensitive to hot and cold, the edges of the front teeth can become thin, even transparent, and are at risk for chipping and fracture. Tooth erosion also results in excessive wear of teeth that may lead to shorter teeth over time. 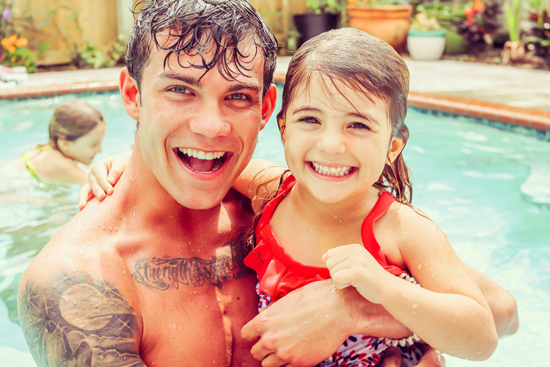 Safeguard your family’s oral health by making sure that the pH in your local swimming pool is not too acidic. Tip 1: Look around the pool. If the pool water is too acidic you may notice spots of erosion on the railing, ladders or pool lining. The water may do the same to your teeth, so consider skipping your swim. Tip 2: If you own a pool make sure that your the water’s pH is in good balance and test it once a week by using pH strips, which are available at most pool supply stores or online. And keep in mind: Brushing your teeth before swimming in the pool can protect your enamel from acid erosion. This removes bacterial biofilm from your teeth and adds protective agents such as Calcium and Fluoride ions to your teeth. Also, remember to stay well hydrated, using plain water only, instead of acidic beverages and energy drinks. Follow these tips to help prevent unnecessary tooth erosion and enjoy your summer fun in the pool!